Stripe is a well-respected international Payment Gateway with support for a large number of countries and currencies. With Stripe and Give you can accept Credit Card donations directly on your website easily and seamlessly. In order to accept payments with Stripe using Give you will need to have an active Stripe account, the Stripe Give Add-on, and the Give Core plugin installed and activated. If you plan on accepting Credit Cards on site we also highly recommend you have an SSL certificate. After your Stripe Add-on is activated, go to “Donations > Settings” and click on the Payment Gateways tab. There you will see the default Payment Gateways (PayPal Standard, Test Payment, and Offline Donations). With the Stripe addon active, there’s a Stripe option/section as well. 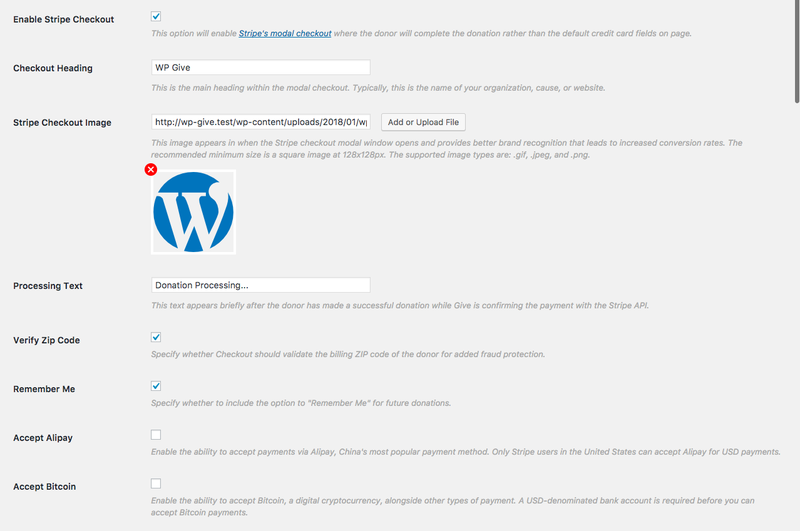 Check the checkbox to enable Stripe as your credit card Gateway for your website, and change the front-end label that donors see, if you’d like. If you would like to accept credit cards directly on your website with Stripe you will need an SSL certificate. Once you have activated the Add-on it’s time to get connected to Stripe. 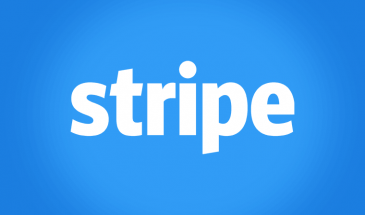 There are two methods for connecting to Stripe, the Stripe Connect Method and the API Key method. The Stripe Connect banner that displays in wp-admin prompting your to connect to Stripe. Click the “Connect with Stripe” button. This will redirect you to Stripe and prompt you to connect. You can also find this method of connection at Donations > Settings > Payment Gateways (tab) > Stripe Settings (section). 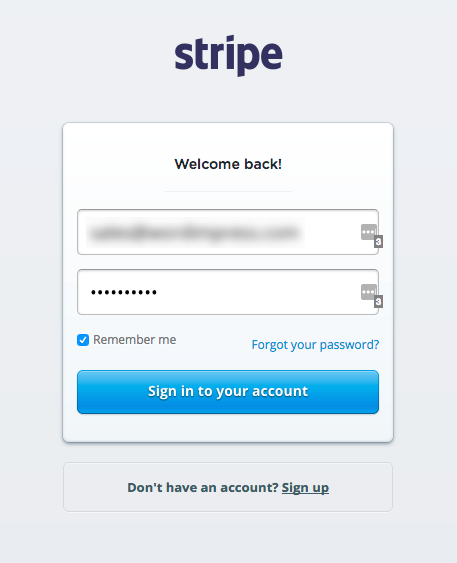 The Stripe login will appear if you are not currently logged in to Stripe. You will see a screen prompting to connect to the Give Stripe application. Click “Connect my Stripe account”. Give is now connected to your Stripe account and ready to accept both live and test donations. If for some reason you need to disconnect Give from Stripe you can do so by clicking the “Disconnect” button found under the gateway’s settings. 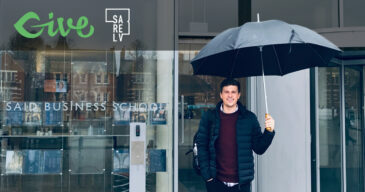 Disconnecting from Stripe will remove the ability to accept online donations until reconnected. Disconnecting from Stripe will remove the connection between the website you are disconnecting as well as any other sites that you have connected Give using the same Stripe account. Proceed with caution when disconnecting if you have multiple sites connected. If you want to use your own Stripe account’s API keys to connect to Stripe you can do so. Note: you do not need to use your own API keys if you are already connected to Stripe. 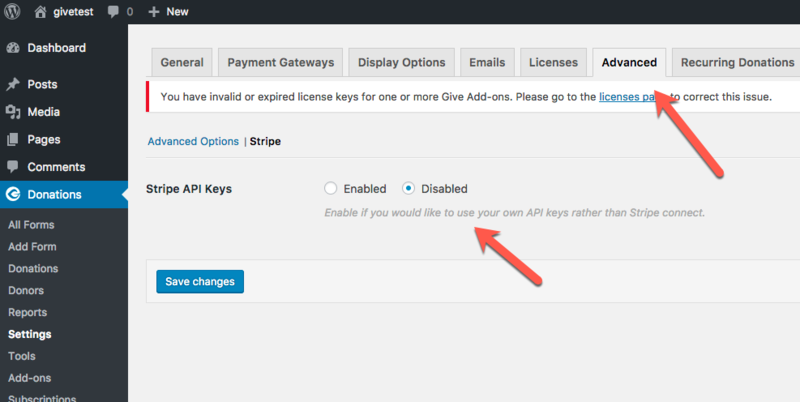 Once enabled you can now obtain your API Keys and configure your Give Settings to integrate with Stripe. Login to your Stripe account and you’ll be presented with the Stripe Dashboard like the image below. There you’ll find all the API Keys you need to integrate Give with your Stripe account. 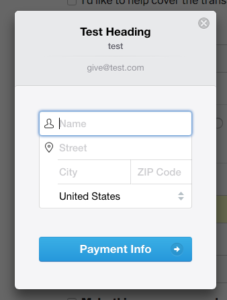 Test Keys are great for testing your donation forms before pushing your site live. When you are ready to go live, make sure to update your Stripe Add-on settings with the Live Secret and Publishable Keys. Important: for live keys, follow the same steps above AFTER toggling the stripe dashboard into live mode. Test keys generally start with “sk_test” for the secret key and “pk_test” for the publishable key. 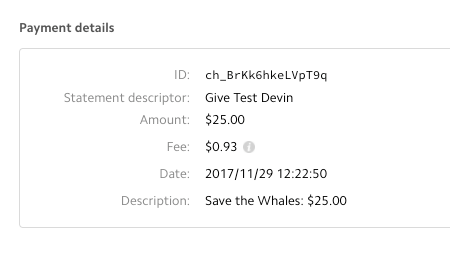 Enter those keys in the appropriate spot in the Stripe settings for test donation. When your site is in Give test mode (more on that below) it uses these keys. Copy each key and go to your WordPress site. Go to “Donations > Settings” and click on the Payment Gateways tab. There you’ll see a section called Stripe Settings. Paste each key into its respective field, then save settings. Options: any 22 alphanumeric characters. This is the text that appears on your donor’s bank statements. Statement descriptors are limited to 22 characters, cannot use the special characters <, >, ', or ", and must not consist solely of numbers. This is typically the name of your website or organization. This allows you to customize the info that displays on bank statements. Note: There must be a value in this field for Stripe to function properly. A default value of your site name is typically set, but in rare circumstances, this field appears blank by default. In that case, save a value here to restore functionality. 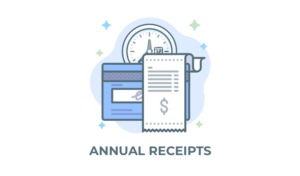 This setting allows you to collect Address data along with donations, so that donation records include addresses at Give. The address is not necessary to process the donation at Stripe, but you may have a need to collect it. This allows you to preapprove payments but not charge until up to seven days after the donation has been made. If selected, you need to manually go in and mark donations as approved before the money will come into your Stripe account. After 7 days, the money is not recoverable. Note: Preapproval does not work for Recurring donations or ACH (bank account) payments. If enabled, those payments will process immediately. This checkbox enables Apple Pay and Google Pay. Checkout Heading: This is the main heading within the modal checkout. Stripe Checkout Image: This image appears in when the Stripe checkout modal window. Verify Zip Code: If enabled, Checkout should validate the billing ZIP code of the donor for added fraud protection. Remember Me: If enabled, Checkout would remember the card details for future donations. 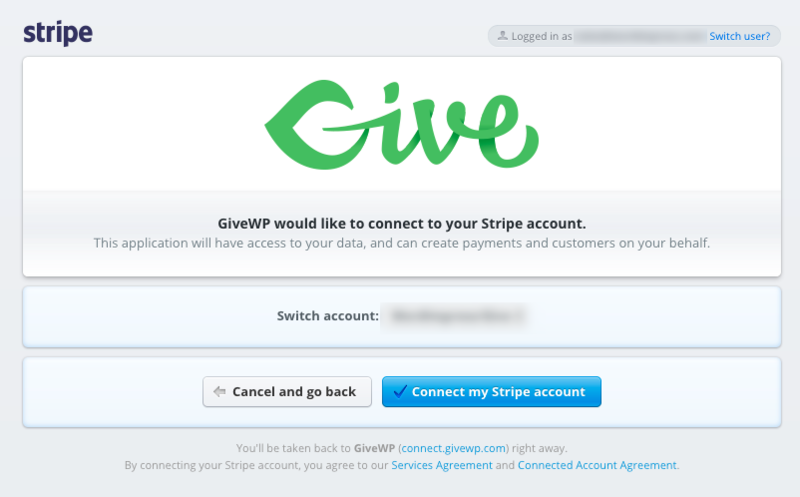 Once you have configured and saved the above settings, you would now see a Stripe Modal checkout like below while donation using Stripe. Note: 3D secure card payments are not available when using the Stripe Modal Window. If accepting 3D secure card payments is necessary, using the standard Stripe credit card fields is required. Give Stripe with a slick single field for collecting card data directly on the site.